Sorry I haven't posted in a long time. I am working on something about my dad that I will post soon. I love you all. I lost my Cell phone about 3 weeks ago, and I have just been expecting it to show up. Natasha and I have gone through the lost and founds of many buildings on campus, but altogether, it hasn't been that bad not having my phone so I wasn't all that worried. However, I just got a part in the play here on campus, and my rehearsal schedule is going to keep me from Natasha a lot, and I really wanted my phone (I also have lost my scriptures, and I felt extremely frustrated.) So I remembered that Natasha once told me to pray to find my phone but I never did, until this morning. I said my prayer and offered thanks to God for the blessings I do have and asked to find my phone, well my scriptures first, and then my phone. I finished my prayer and sat down on the couch and felt under the cushions just to see. I found an area under the cushions, over the springs, under the cushioned back and down to the ground. I had felt this area before looking for my phone, but I had never realized that it didn't empty out into the ground. I reached my arm back over the cushions, over the springs, and under the hard wood that makes the back. I had to really push and hurt my wrist a little, but I felt something. I threw the couch onto its back and realized that it doesn't empty onto the ground, and if my phone were there, it wouldn't have just fallen onto the floor, like I had always assumed it would. I got scissors and cut a hole in the gossamer fabric covering the bottom. I pulled out a remote, a calculator, a spoon, some trash and then my cell phone. Not more than 45 seconds after ending my first prayer for God to help me find my phone, I found it. Our God is an Awesome God. We went camping with the Caldwells in Dell, MT. We drove the four wheelers up lime kiln canyon and made the most amazing handmade fire pit ever. We cooked elk steaks (thanks again Scott) which were delicious and Melissa made awesome omelettes for breakfast the next morning. It was the perfect way to end the break. The ground was a little hard and we were all a little cold at night, but seeing all the stars in that big Montana sky made it worth it. We also ate Yesterday's Calf-a's famous roast beef which was the most amazing meat I've ever eaten. We start class tomorrow, and I am excited. I am taking two writing classes (three if you count spanish) American Lit and New Testament. 15 credits is going to be tough with all 300 level classes, but I ain't worried; I love school. This week we went to an Alpaca Farm near Bozeman, Montana. Alpacas are related to llamas but they are smaller and their hair is finer (twice as thin as cashmere fiber). Each of these little guys is worth $40,000. They are very gentle, but that didn't stop the little guy that Natasha is petting from kicking the little guy in the hat in the other picture. The little guy is my cousin Zach Sperry from Montana. He is the smartest little kid I've ever seen. At two and a half he can replace words in popular songs, and start conversations. It was fun to visit. He belongs to my cousins Jeff and Jennifer Sperry. We had a great trip. The sky is big in Montana. Perfect for alpacas. Everyone should check out The Mormon Tabernacle Choir's new CD "Choose Something Like a Star." They sing Robert Frost poems and "A Girl's Garden" is the coolest song Mo Tab has ever done. 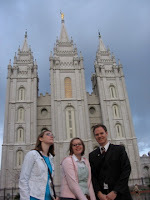 Natasha and I made a whirlwind trip to Salt Lake. 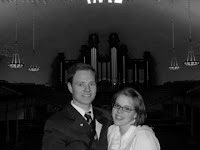 here we are in the newly renovated Tabernacle at Temple Square. 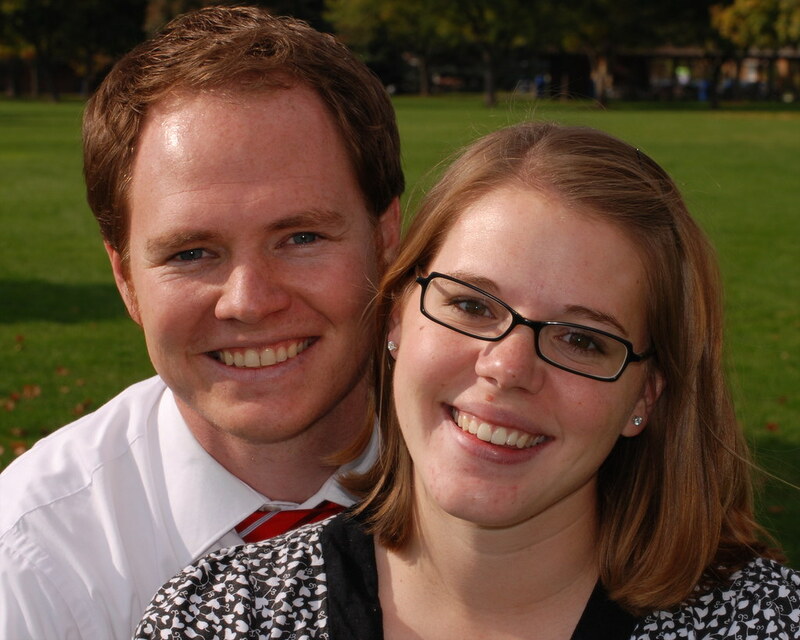 I watched the first two sessions in the Taylor Chapel on campus and then I missed the preisthood session driving. 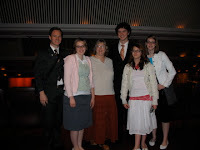 Then were in the conference center for Sunday morning and in the Joseph Smith Theatre for Sunday afternoon. I listened to every talk closely waiting for some answer to my Law School-MFA dilemma. Elder Holland started talking about words and I got excited thinking it was exactly what I needed. It ended up being about the words we speak, not write (and one of my favorite talks). But talk after talk I didn't think of anything thing that had to do with an answer to my prayer. Well, that's not true. Someone spoke about answers to our prayers in general, I think it was Earl Tingey, and that helped me realize that law school isn't the right path because my interest has piddled out, just like he said something like, "the lord will not let you get very far in a path that isn't right." Then the rest of the talks were good. I thought president Hinckley made a very interesting choice. He just went over the basics of the gospel: Joseph Smith is a prophet, we have the preisthood, the temple is the house of God, the Book of Mormon is true. i didn't know what to make of it, but I liked it nonetheless. Then, at the very end of conference, the last hymn the choir (the choir is the most amazing part of conference in the conference center) sang I need the every hour, one of my favorites. They sang very differently though. It had two melodies, the women sang the original solemn, pensive melody and the men sang a somber, desperately pleading counterpoint. As I listened, I imagined a person that pleads to God for help, but as he does so, he humiliates himself by admitting he can't do it himself. The ambivalence was absolutely beautiful, tense, and emotionally packed, and I thought, that's what I love. I love characters, and figuring out their motivations and ambivalences. I want to do creative writing. Law is not what I love. I'm still scared about getting a career, but I know that Heavenly Father is guiding me, and I know that we will be OK.